John Gremillion is a stage, film and voice actor who has been working in anime for nearly 20 years. He has provided voices for dozens of popular anime titles for ADV, FUNimation, Okratron 5000, Seraphim Digital and Sentai Filmworks. John recently played Takeshi Hirokawa in Parasyte: The Maxim and General Liver in Akame Ga Kill!, both seen on Adult Swim's Toonami. 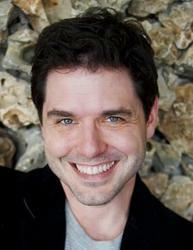 In 2015, he was nominated for BTVA's Best Male Lead Vocal Performance in an Anime Feature Film for the role of "D" in Sentai's re-dub of Vampire Hunter D. Some of John's other popular roles include Dracule Mihawk in One Piece, Arthur Randall in Black Butler, Hakuoro in Utawarerumono, Daiju Mononobe in Eden of the East, Cardinal Francesco in Trinity Blood, Albedo Piazzolla in Xenosaga, Schawanheld Bulge in Galaxy Railways, Law in Full Metal Alchamist, Fal (The Duel) in Halo Legends, Yutaka Takenouchi in Cromartie High School, Dr. Kestner in Appleseed Ex Machina, and Makoto Shinjou in Area 88. John has played supporting roles in such titles as Spriggan, Summer Wars, Devil Survivor 2, Air Gear, Phi Brain, Five Numbers!, Devil May Cry, Darker than Black, Coyote Ragtime Show, Speed Grapher, Full Metal Panic!, Peacemaker, Desert Punk, Gilgamesh, Gantz, D.N. Angel, Chrono Crusade, Saiyuki, Princess Nine and Gasraki, to name a few. A professional video editor for over 20 years, John worked with ADV Films on the supplemental materials for their 2010 release of Halo Legends. In addition to anime, John has provided voice over for several commercials and some feature films. He studied film at The University of Texas at Austin and Theatre Arts at The Juilliard School.